Adidas and Parley Partner To Help Tackle Ocean Waste - We Love Sharks! Adidas and Parley Partner To Help Tackle Ocean Waste - We Love Sharks! Adidas and Parley embark on various upcycling projects to help tackle ocean waste. Leading sportswear manufacturer Adidas announced some months back the release of environmentally friendly football kits. The kits are for two of the biggest football teams: FC Bayern Munich and Real Madrid. This release is part of an ongoing partnership with Parley for the Ocean, an ocean conservation group. The partnership seeks to address one of the most pressing threats the world’s oceans are facing. That’s plastic waste pollution. The new jerseys are made from marine plastic debris and also feature water-based environmental-friendly prints for the crests and sponsor’s logos. 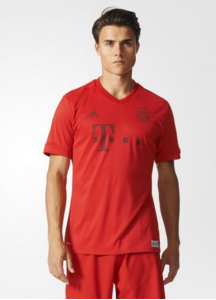 For Bayern Munich, the jerseys are all-red with monochrome dark red club crest, and dark red T Mobile branding. It has red Adidas stripes on the shoulder. There’s a back neck tape labeled with “For the oceans” on each top. Logos for Adidas and Parley are woven on an outer tag at the bottom left of the top. The set is completed with all-red shorts and socks. 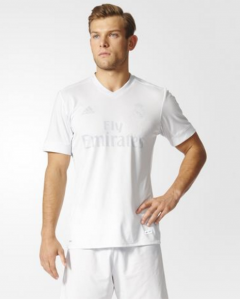 The Real Madrid kit follows pretty much the same idea. But this time in all-white with 3 stripes on the shoulders and monochrome logos on the front for the club crest, Adidas brand, and bold ‘Fly Emirates’ print. But football kits are just a part of what they are making. The partners have also successfully launched footwear made from recycled ocean plastic. 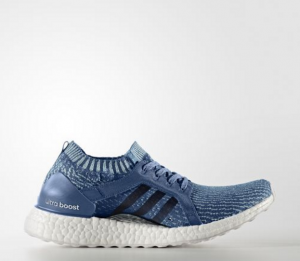 Specifically, the sneaker is called the Ultra Boost Uncaged Adidas X Parley Shoe. The first collection released numbers a total of 7,000 pairs made from upcycled ocean waste. The upper part of each shoe is made from 5 percent polyester and 95 percent ocean plastic waste dredged from the waters around the Maldives. Also, each of these sneakers is made using 11 plastic bottles. In line with the same eco-innovation drive, Adidas intends to make one million pairs of shoes using Parley Ocean Plastic in 2017. “The ultimate ambition is to eliminate virgin plastic from our supply chain” says Cyrill Gutsch, founder of Parley for the Oceans. You can read more about this eco-innovation strategy here: Adidas And Parley. Why This Kind Of Eco-Innovation Is Important To Sharks And Other Sea Animals. Ocean plastic pollution has become a worrisome tragedy for all sea animals, sharks included. Consider this: marine debris today consists of plastic shopping bags, plastic cups, plates, and spoons. Other items include food wrappers, rope and string, rubber tires and even cigarette butts. And that’s just the tip of the iceberg when you begin to add things like disposable diapers, aluminum cans, etc. When you consider the fact that some of these items take over 400 years to degrade, you can see why the oceans rightful inhabitants are in trouble. 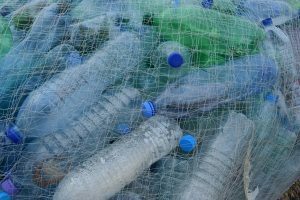 Despite many commendable recycling efforts, plastic in particular still appears to be taking over the world, and we are at a loss about how to effectively get rid of it. Even when plastic is broken down into tiny bits, the polymer chains are so strong that the bits can last for hundreds of years. Take the incident of the ‘floatees’ for instance. On January 10, 1992 a cargo ship sailing from Hong Kong encountered a storm and accidentally tipped 12 containers of plastic toys into the Pacific Ocean. The containers burst open releasing almost 30,000 plastic floating toys into the waters. The toys were named ‘floatees’ by the media and they included green frogs, blue turtles, yellow floating ducks, etc. To date, the toys are still floating and still popping up at different locations around the world’s oceans. Because of circulating oceanic water patterns (gyres), it’s not uncommon to see large patches of oceanic plastic garbage moving in disgusting-looking formations across the waters. 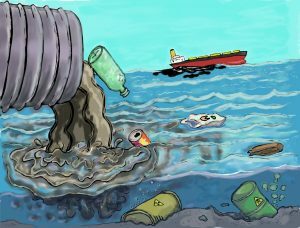 In fact, the California Coastal Commission estimates that there are up to 46,000 pieces of plastic litter in every square mile of ocean. In addition, a swirling vortex of trash calculated to be about twice the size of Texas has spawned in the North Pacific. And what do you think happens when sharks and fish encounter these clumps? Out of curiosity, they will usually swallow at least a few of these objects before they realize it’s not palatable. Some of the very tiny plastic particles look like zooplankton and birds and small fish regularly eat these pellets mistaking them for food. The larger fish then eat the small fish and the chain reaction goes on. Since plastic does not degrade even when swallowed, the objects just take up space in the animal’s stomach. If that particular animal keeps swallowing more plastic, there’ll eventually be very little space left for real food! We are effectively bombarding the oceans with our plastic waste from two directions: ships/boats/oil rigs and from land/beach/shoreline activities. These plastic and other waste items are polluting the oceans and killing the unsuspecting sea animals that will inevitably eat them. It’s not strange these days to find plastic items in the gut of dissected sea animals. Even when they don’t ingest these items, sharks and other sea creatures regularly get entangled with plastic ropes and large wrappers. As a result, most will suffocate and die before they are rescued. Here’s the link to a detailed and alarming report by Greenpeace on the effects of ocean waste on marine life. Just like Adidas said, one single entity can’t end pollution. It’s no longer just about raising awareness, but about taking action and implementing strategies that can end the cycle of plastic pollution for good.